The little batteries in our cells are a critical part of what keeps us going. However, are they also a critical part in stem cell function? A new study on the mitochondria in brain cells may help us one day figure out new ways to cure Alzheimer’s disease. It’s hard to believe, but your cells have organs like your body. These are called organelles, which is Latin for little organs (e.g., nucleus, mitochondria, endoplasmic reticulum, etc.). While the nucleus, which houses our chromosomes that carry our DNA and our genetic makeup, is often what we hear about the most, the mitochondria, in recent years, have certainly started to earn their place as a close second. Mitochondria are our cells’ energy source, the batteries or power supply as I’ve shared before. In other words, the mitochondria “keep the lights on” as they generate the energy for the cells. Where does this energy come from? The nutrients we consume in our food is converted by the mitochondria into chemical energy that powers the operation of the cells. While the mitochondrial claim to fame may be as the powerhouse of the cell, science continues to discover that the mitochondria do quite a bit more. I’ll review the newest study on the mitochondria and brain stem cell function in a moment, but first, let’s take a look at the amazing things we’ve already learned about the mitochondria. First, we praise exercise often on this blog, and for good reason: it’s not only good for the body as a whole, but it’s been found to improve function all the way down to the cellular level. In fact, we can go deeper into the cell and find that exercise, at most any level, results in healthier mitochondria, which could translate to healthier cells and tissues and more effective resistance to certain diseases. While the mitochondria do naturally burn out as the cells age, mitochondria can also become damaged in other ways. Ciprofloxacin, a quinolone antibiotic, for example, has been shown to inhibit an enzyme that is critical to the proper functioning of the mitochondria. Ciprofloxacin, in one study, was found to disrupt energy production by the mitochondria. One study found a significant decrease in the mitochondrial protein carbonic anhydrase not only in aging mice but also in mice with known brain degeneration. In those with a degenerative disease, the mitochondria burnout could be found in region-specific areas of the brain, while in the aging group, the mitochondria burnout was found to affect the entire brain. 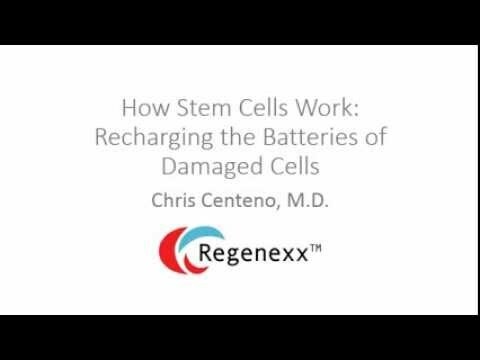 We also already know that our stem cells can recharge our mitochondria by transferring their “good batteries” to the damaged cell, so perhaps as science progresses, it will discover ways to populate the human brain with more stem cells that can recharge the mitochondria of those damaged cells and decrease cognitive decline in aging in the process. Learn more about this in my video below. I covered another recent finding on stem cells and this mitochondrial transfer in endothelial cells that line the cerebral vessels, specifically stem cells transplanted into these vessels following a stroke. The transplant resulted not only in functional improvements following the stroke but also enhanced blood vessel formation (important for healing). To grasp the new study, it’s important to understand that while those fun models and diagrams of cells we created in science class or for science fairs were pretty cool to look at, our mitochondria don’t actually look like little Jelly Bellies permanently affixed to precise locations in the cell. They are living structures that move and morph or transform shape. They elongate and fuse with other mitochondria, creating tubular shapes, and then shrink and split back apart—all in a constant cycling state of motion, releasing signaling chemicals in the process that regulate cellular functions. It is this morphing functionality of the mitochondria, and more specifically the fact that they are changeable and not static, that researchers in a new study have linked to the mitochondria’s ability to affect not only the fate but also the creation and function of neurons, or nerve cells in the brain. Researchers concluded that these morphing mitochondria were critical regulators not only of neural stem cell function but, in turn, of cognitive function. Meaning, this is likely more research tieing bad mitochondria to loss of the ability to think quickly and remember as we age. What does all of this mean exactly? That perhaps in the future, finding ways to target the mitochondria in brain stem cell treatments may lead to solutions for cognitive decline. There is still much research to be done in this area, but it will be interesting to see what the next decade reveals regarding brain stem cells and the mitochondria. The upshot? The batteries in our cells are a big deal. The mitochondria are a critical cell organ that not only supplies the power to our bodies but also allows our stem cells to function normally. In addition, stem cells work by transferring their good mitochondria to replace damaged ones. So you can certainly see a day when a viable treatment for cognitive decline may be a brain stem cell recharge!